It took a trip to Berlin for me to see the true power of imagination behind today’s anniversary. “It strikes me that our lives have been powerfully shaped by two dates: 11/9 and 9/11. These two dates represent the two competing forms of imagination at work in the world today: the creative imagination of 11/9 and the destructive imagination of 9/11. One brought down a wall and opened the windows of the world…It unlocked half the planet…Another brought down the World Trade Center…putting up new invisible and concrete walls among people at a time when we thought 11/9 had erased them for good. The dismantling of the Berlin Wall on 11/9 was brought about by people who dared to imagine a different, more open world—one where every human being would be free to realize his or her full potential—and who then summoned the courage to act on that imagination. Thanks to the Transatlantic Outreach Program for making this revelation possible for me. 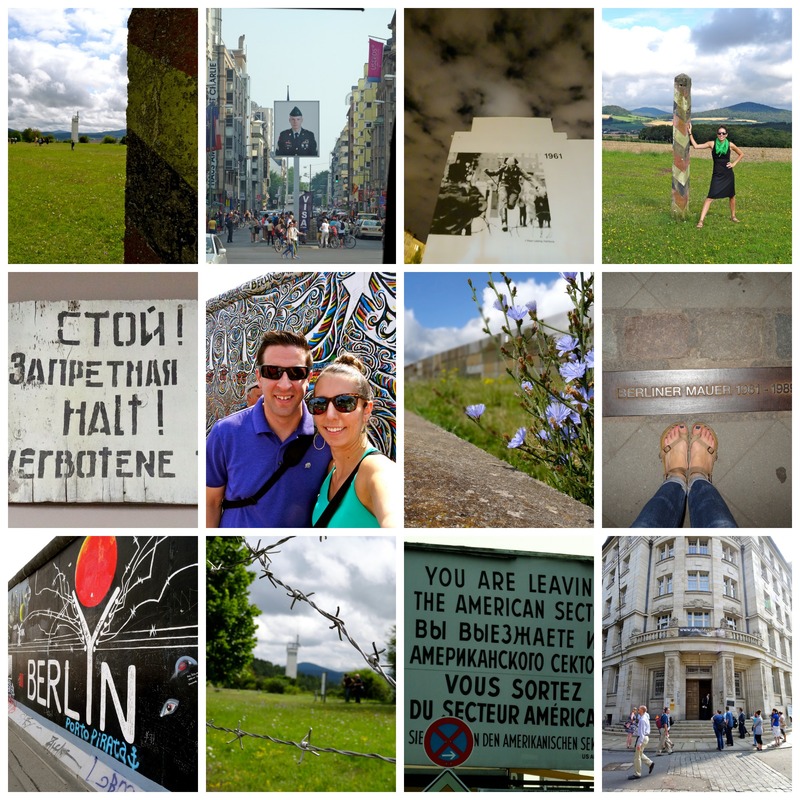 Social Studies teachers, if you’re interested in this kind of learning experience, please contact me about the TOP program and how to apply for the summer fellowship in Germany. Maybe your school has an undesirable course that all your department members try to avoid. Well, for some crazy reason, English 10 is the unwanted reject in my English department, and lucky for me, all this other-teacher-avoidance means I’ve been able to snag my favorite ELA core for the last eight–and now nine–years. Unlike some teachers, I have no dreams of teaching honors or Advanced Placement seniors on the verge of college. I love teaching underclassmen, helping them develop their skills and move on towards later refinement. English 10 is ripe for major composition transformations. With that, I have no need to keep my fingers crossed hoping “Ooh! Maybe someday I’ll have APLit on my schedule.” Nope, that’s not what I’m after; instead, I want to keep the end in mind and have the Advanced Placement courses as a goal for my students. Even if they choose not to take them, I want my students to be prepared for the demands of AP, college, and beyond. This summer, thanks to the support of my principal, I was able to attend APLit training in an effort to prep my soph-ies for the rigor of the College Board. I’ve been doing similar work with APUSH for the last few years in my sophomore US History, pairing down the skills required to dominate the DBQ, but this summer I got the chance to finally tackle the expectations of APLit. One of the biggest things my sophomores have been trying to tackle has been Literary Analyses. In particular, my students are quick to say that they struggle to find the purpose in writing them in the first place. If we can work on this early–eighth, ninth, and tenth grade–and as a whole department–common language and delivery–, I think that all students will write better essays. In English 10, I typically get a class set of nearly identical Literary Analysis essays, all talking about the same symbols, same theme, and same characters. It’s just a regurgitation of class discussion or maybe Sparknotes. Thankfully, my kids can blend quotes and–for the most part–explain how they support their claim. The problem is that these essays are formulaic and incredibly boring to read. You know how it is when you’re sitting at Panera all Saturday grading essays and one after the other, you can’t tell the difference between each student’s idea. It’s torture. No wonder I eat so many bear claws! Last year, Dave Stuart, author of the new gem A Non-Freaked Out Approach to Teaching the Common Core, shared this great article, “How ’bout That Wordsworth!”, by Jerry Graff. If you follow this blog, you already understand the high regard that I hold both Stu’s recommendations and Graff and Cathy Birkenstein’s book, as I’ve already mentioned both a number of times, so, of course, I jumped on this resource. It’s a powerful (and short–Yay! Only 2 pages!) 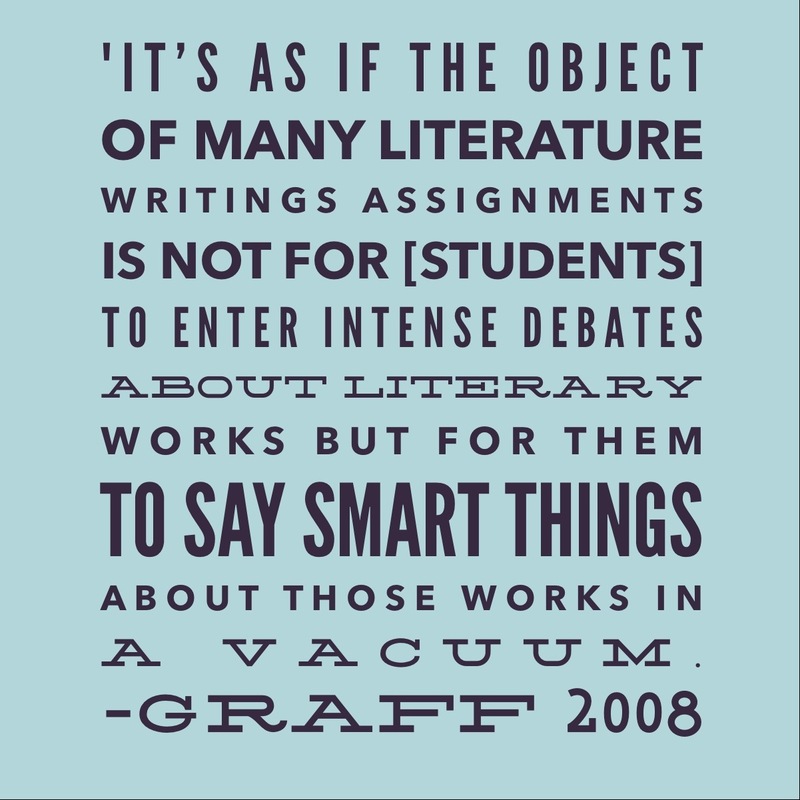 article about pushing students to write better and more meaningful Literary Analysis. You should totally read it, but I want to use this post to give you a few snippets. I realize that my students essays were boring, because they were trying to play it off like they were the only readers who had ever thought that Daisy’s green light means something more than a green light. Kids can’t pretend that they’re the only people who have ever talked critically about that particular book. It makes their writing lose any life or argumentative weight. 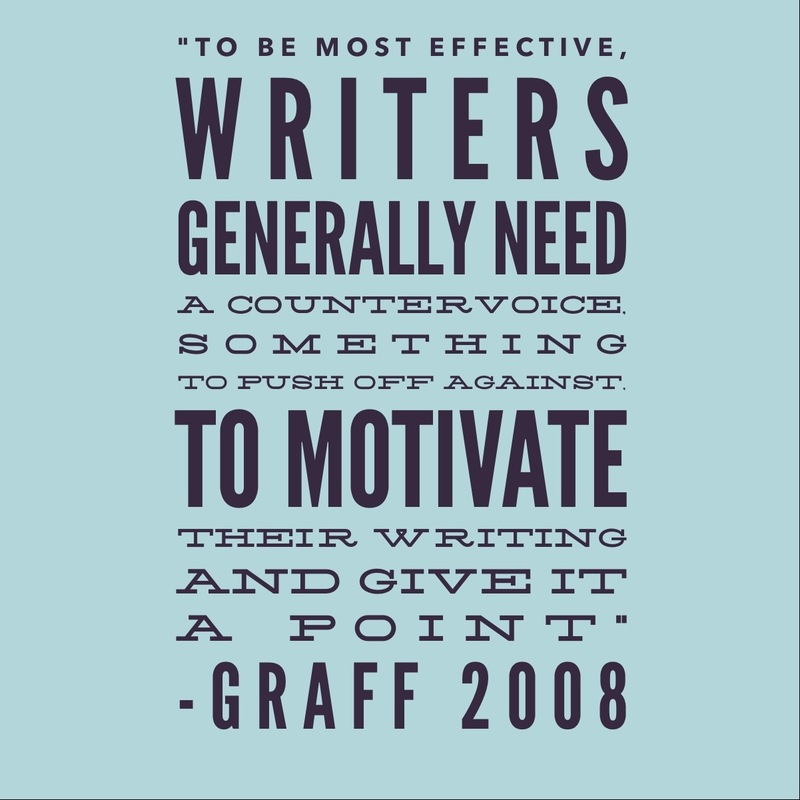 Graff says, “The assumption is that persuasive writers need…a conversation to motivate their own arguments–that unless we are provoked by the views of others, we have no reason to make persuasive arguments at all.” Exactly! Kids may not have the consciousness or the gall to ask “Why are we even talking about these ‘enchanted’ objects? What’s the whole point?” Without someone to get the conversation started, our kids have no grounds for debate, so we’ve been playing with this idea of responding to other sources who have also discussed the book. Sometimes this is easy as looking at the book’s foreword; other times I share analyses by literary critics (Bonus: They work as great mentor texts). With our Great Gatsby essays, I shared Matthew Bruccoli’s foreword (found in the front of our edition) and John Green’s Gatsby Crash Course (Part 1 & Part 2). Sucking the assignment out of the vacuum and bringing in other “They Say” critics made my students’ arguments not only more engaging reads but they also provided so much more direction. According to Critic A, novel X suggest _______, I agree but would add that ________. Several members of our class have suggested that the final message of play X is ________. I agree up to a point, but I still think that _______. Some teachers might feel uneasy when they see the use of personal pronouns and class debate blended into formal essays. Until this last year, I was one of those teachers. I marked kids down. I guided them away from this kind of writing, thinking that it was too casual and not persuasive. But since attending the APLit training and reading Graff’s article—keep in mind he was the president of the Modern Language Association, I’ve come to realize that these are key moves to add voice and life to our writing. Real literary critics do it too, you know, when they’re not writing 5-paragraph essays. Okay, so I’m obviously still new to this APLit prep. I’d love to hear what you have to say. What is working for you and your students? Where do you find solid literary counter voices? How do you help your students increase their sophistication? What’s your take on the personal pronoun debate? How do you feel about students infusing their peers’ literary critiques into their papers? Last week, I was so fortunate to have the opportunity to tour the beautiful state of Michigan—from Parma, down in the Southeast, to Mackinac Island, up off the North shore of Lake Huron—in order to share and connect with some incredibly dedicated educators. Starting in Parma, I was invited to speak at Day One of nErd Camp 2014 on the topic of secondary writing. Lead by teachers, authors, and other education professionals, Day One included a handful of sessions on specific topics related to technology, writing, and reading. The second day was modeled similarly to other edcamps with the conference participants coming up with and leading the session topics in an spontaneous and organic fashion; however, the Nerdy Book Club takes the “unconference” format of edcamp and focuses again on all things literacy. My session, “Demystifying Academic Writing,” took the work of some of our favorite writing gurus and broke down how to scaffold and differentiate academic writing for secondary students. We looked at high levels of support, like the two-paragraph model that Stu introduced me to a while back, and more independent levels of sophistication, like the They Say, I Say templates from Graff and Birkenstein, that help guide students towards independent and intellectual writing. 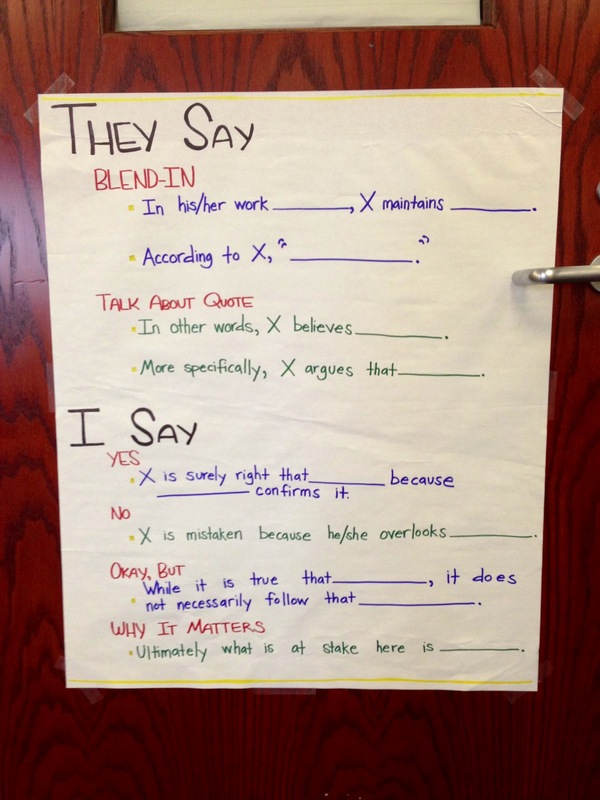 Using one of my favorite Leonard Pitts’ Articles of the Week, we walked through the process I take with my students as they step away from casual, chatty tones and towards the language of scholars. If you’re interested in checking out the handout or the Prezi, you can follow the links here. What a joy it is to be a part of this energetic and engaged group of people! Even with all of the powerful connections we can make on Twitter and other online forums, I am always amazed at how face-to-face conferences can deepen these PLN relationships. Each session brought new ideas and more book purchases. Across Day Two, I got to absorb how other high school teachers are able to adapt a workshop model to fit their classrooms. I got to soak up a crazy-long list of diverse books for diverse readers. I got to spill what it’s like to be a social studies teacher trying to “do” literacy with other non-ELA teachers. From Parma, I headed up through the gorgeous wooded landscape of Northern Michigan to ferry across the blue waters of Lake Huron before reaching picturesque Mackinac Island. The island, for those of you who haven’t yet visited, is a storybook setting, dotted with tasty fudge shops and art galleries and where the only transportation is from horse-drawn carriages and tandem bicycles. Serious, what better place is there to attend a literacy conference? More intimate that the annual Michigan Reading Association conference in Grand Rapids, the MRA summer literacy conference gives participants a chance to slow down and connect with other educators instead of rushing across the city center to find a seat before the next keynote address. As an adjunct faculty at Grand Valley State University, I was asked by the conference organizers, GVSU professors Liz Storey, Pam Page, and Nancy Patterson, to share some books and strategies that get adolescents enthused about reading. 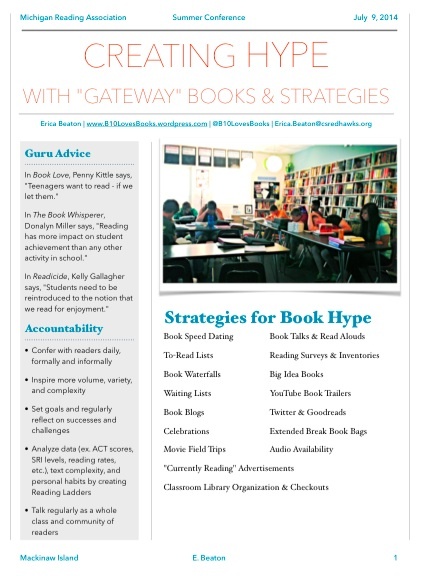 My session, “Creating Hype with ‘Gateway’ Books & Strategies,” moved through methods of accountability in a choice reading workshop to many of the strategies I discuss in my “Tips for Getting Kids to Do More Choice Reading” blog series. The session also provided teachers with a list of the books that even my most defiant readers latch on to along with ideas about how to develop their own abundant, classroom libraries. If you’re interested in the MRA Summer 2014 Handout or the Prezi, here are the links. As if he created a “guided instruction” model himself, we had the opportunity to further our online connection face-to-face after he graciously attended and live-tweeted from my session later that morning (Thanks again, Troy!). What last week’s whirlwind literacy roadtrip reinforced for me is the importance of developing my PLN beyond the computer screen. 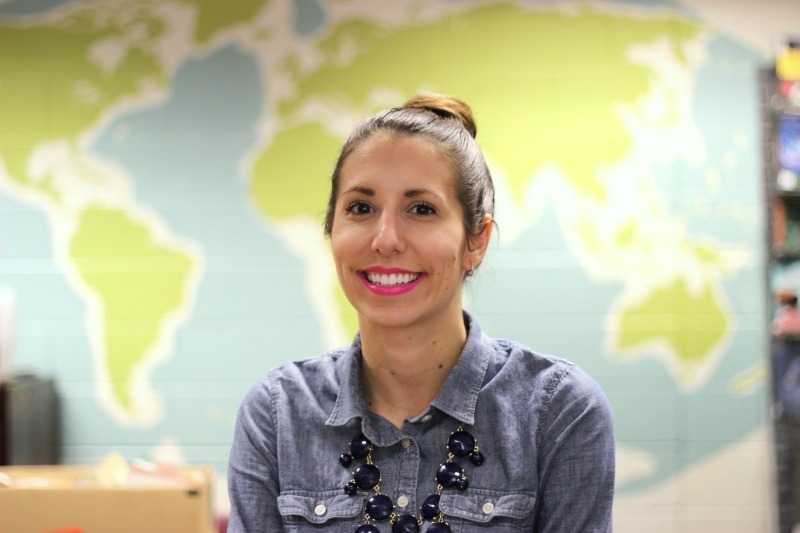 In those isolating winter months, where my students seem to be the only faces I see, Twitter breaks down the barriers and allows me to connect with teachers across the globe and share my successes and frustrations. But when it comes to the warm, glorious months of summer vacation, I’m not one to sit back and forget about my classroom and the demands for next August. I realize that actually meeting up with my online community in the “real world” gives me energy and accountability for the work ahead of me. So, even if I’m driving solo up I-75 for fours hours with nothing more than audio book to keep me company, I’ll gladly take that as a convenient excuse to hit the road for some solid professional development. 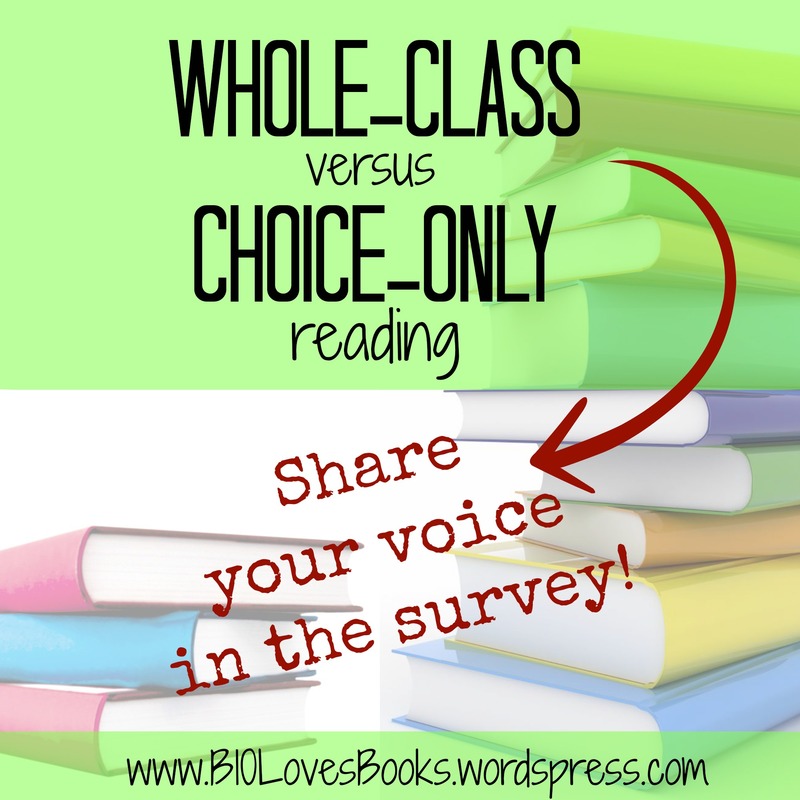 Responses to the “Whole-Class vs. Choice-Only Reading” survey are still rolling in. Thanks for all your help! If you haven’t responded or shared the survey yet, please do so. Even if you feel like your literacy approach is restricted based on the pressure of your department, district, or state standards, we’d love to have your voice included in the survey. Interestingly—but rather unsurprisingly—when it comes to this “debate,” most of you B10LovesBooks readers find value in both sharing whole-class novels and promoting choice-reading. Theses voices calling for some balance—whatever our specific ratio might be for our classes—need to be present in the larger literacy community. 1. Choice Reading encourages students to develop personal reader identities. If a student can learn what types of texts he loves to read independently, the likelihood that he will develop long-term independent reading habits is so much greater than if he wasn’t provided any choice. Who we are as readers defines us beyond our years in school, so we need to help students understand this aspect of their individual development. From genre and topics to habits and unique choices, students need to figure out what they love and how they read best. This self-discovery not only helps them truly identify themselves, but it also invites an awareness to areas where can grow and might need support. 2. Choice Reading encourages students to improve their stamina and fluency. As with any passion that we’re developing, we need time to practice before we can be expected to do it with any ease or endurance. Malcolm Gladwell says that we need 10,000 hours of deliberate practice to become an expert; therefore, to help our students’ stamina and fluency grow in the long-term, we need to get them reading as much as possible. My students and I always talk about developing these literacy skills within an analogy of marathon training. I can’t just expect to just show up ready to run the 26.2 with all the other racers without putting in miles and miles of training on my own, nor can I push myself as a runner to do hill sprints every day and think that rigor alone will prepare me for the big race or make want to even continue running when it’s all over. In terms of this analogy, I don’t even need to get into the danger of skipping hills altogether for the sake of only doing “fun runs,” because, by now, even if you don’t follow #runteacherrun, you get the idea. 3. Choice Reading encourages students to practice independent habits. As adult readers, we know what it’s like be in the flow: to look up after we’ve read that last page, with tears still in our eyes, and notice that time has totally flown past us. As adult readers, we’ve developed habits independent of others in order to maintain (or at least attempt to control) our love of reading. Young readers are still learning how to manage their time, make plans for reading, engage in conversations with others, and find books on their own. Choice reading helps students develop these habits in the safe space of our classroom yet without the full on, high support of a shared text. 4. Whole-Class books support students as they build a shared intellectual experience. When a learning community shares a text, they come together to share not just the plot and theme but a common, social experience. With their unique skills and individual backgrounds, students can build a rich conversation and deep collective thinking that will move the community beyond the state of just a singular understanding to “Ah ha! I never thought about it that way!” Together, students and teachers can model their thinking and strategy use for one another all while navigating complexity within their larger, collective expertise. 5. Whole-Class books support students meet the expectations of cultural literacy. 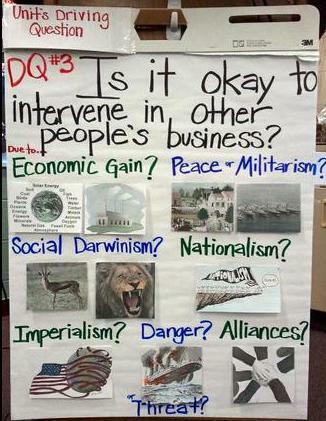 Outside of school, students will encounter all kinds of allusions to literature and references to informational texts. Already, in this post, I mentioned ideas from Gladwell’s Outliers. Now, if you’ve read this book yourself, you understand my reference on deeper level than those who haven’t yet it (Go and read! Seriously, see how geeked my kids were about it.) When we are in “the know” of cultural literacy, we can build deeper and wiser connections to each other and our world. Now, whether we share with our students texts that are “classics,” popular best-sellers, or otherwise, our students will have a richer, more fulfilling life if they are able to engage in conversations with others about the universal truths found in our society’s most valued books. Teachers can’t fool themselves and say that students will choose to read or understand these respected texts on their own. We need to share many of these important pieces with them in preparation for the rigors of college, career, and life beyond. 6. Whole-Class books support students practice sustained engagement. Within the Reader’s Bill of Rights, among other things, we have the freedom to abandon choice books. This is a liberty to celebrate certainly, but we all worry about that one student who doesn’t stick with a book long enough to maintain any real commitment. She floats from Sarah Dessen to Elizabeth Scott and Susane Colasanti and so on without reading more than 50 pages. She does this, because she doesn’t have any the individual skills or teacher support that compels her to see it through to the end. In the same way, when teachers only share passages or excerpts of larger texts with their students, they remove opportunities to practice extended comprehension skills and examine fully developed literary craftsmanship. When we share whole-class texts with our students, together, we can focus on the content and examine the development of characters and craft over time. 7. Seeking balance supports students acquire character and non-cognitive skills. If you’ve read any of my other posts in the last year, you know that I believe we need to help students develop their character and mindset in order to “promote long-term flourishing.” From the grit that it takes for my students to tackle Outliers in the fall to the self-control they need everyday (Lord, help them!) to cast aside their cell phones and delve into their choice books, we can use both choice reading and whole-class novels to present practice opportunities—or imaginary rehearsals—for students that go beyond literacy. 8. Seeking balance supports students broaden and deepen text exposure. When we challenge our students with open-ended opportunities of choice reading, they can dig deeply into genres, authors, and topics of passion. Take Tristan for example: his “required genres” were all neatly colored in across the bottom of his Reading Invitation chart, but his haphazardly filled in Sci-Fi column towered up and over the backside of the paper, like a doomed Tetris game facing the end. At the same time though, I could help Tristan broaden what he thought was his only territory for reading by supporting him with whole-class texts. When we join our experiences around one shared piece, students are exposed again to genres, authors, and topics that they may not have consider alone but are willing to dive in with a strong community of readers. 9. Seeking balance supports students learn with and from stronger readers. In the world of disciplinary literacy, all teachers must recognize that they are the best readers in the room, precisely because of our various subject backgrounds. As an ELA teacher, I cannot teach my sophomores to read a Bio lab report as well as their science teacher can. In the same way, I cannot expect to be the only “reading teacher” in my classroom. 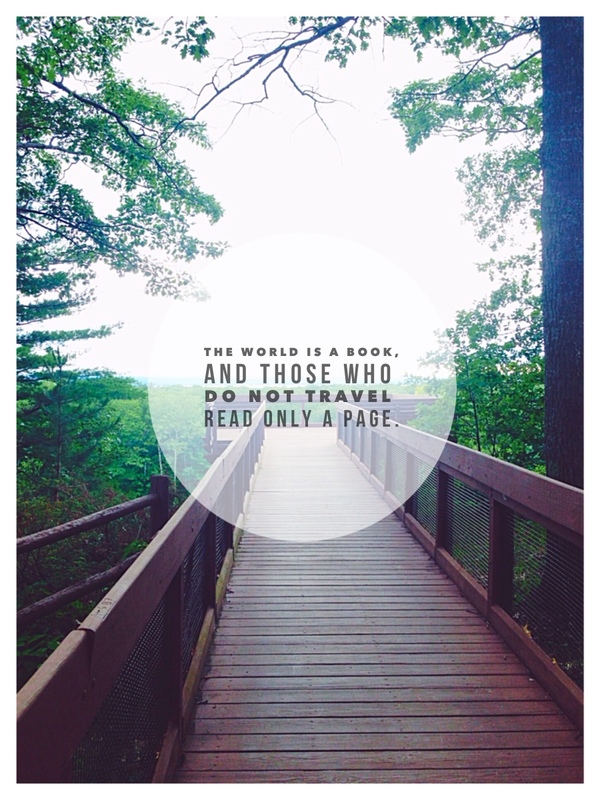 There becomes many expert readers in a class that has balanced approach of choice reading and whole-class novels. Yes, I can support my students understand craft and historical relevancy like no one else in the room,but I can’t do what many of my students can for one another: only Erich can speak widely with Austin about which WWII book more accurately describes the B-52 bombers, and Jaspar and Chaz are they only ones who can share how Columbine shifted their perspectives on mental health, and Gabby and Jakob could lead hour long lectures about the mythology allusions across Rick Riordan’s collection work. It when we come together and move apart on our own that our students can really flourish. As I said, I want to break down each of these points further and connect you with some of the great research that supports these points, but I’m going to take a break from this series in order to share some work from my literacy roadtrip this week. 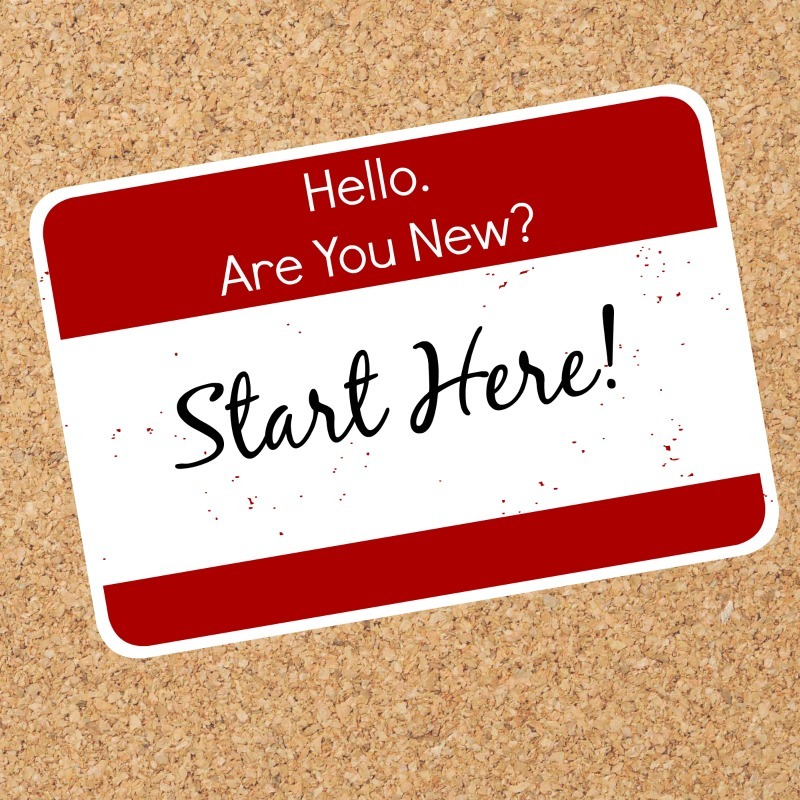 So, if you’re new to B10LovesBooks and have found your way here thanks to nErD Camp or the Michigan Reading Association summer conference, welcome! Oops! I’ve got to start by apologizing. I initiated this series and then took an end-of-the-school-year blogging hiatus. You all know how quickly April turns into June in the classroom, so I appreciate your understanding of the whirlwind that is third trimester. Like I said back in my last post, I want this community to expand the conversation about both whole-class novels and choice reading. We’ve got to ask stakeholders to “chill out” and just seek some balance. They’ve created this false dichotomy that has pushed the pendulum back and forth for too long. Unfortunately, I think it’s—dare I say—“trendy” to only talk about choice reading right now. Whether this pendulum-swinging trend is caused by something extreme, like some reactionary protests to the CCSS, or it’s a heck of a lot less melodramatic, like maybe it just feels good (and easy) to only talk about choice, we have to step back and get real. Most teachers and students value some whole-class novels when they’re done right, and they value some autonomy when it’s supported appropriately. Please don’t take this argument as me bashing those voices that are calling for more choice reading. Not only am I a fan and a disciple of those voices, but I am one of them! Let’s all just take a deep breath and admit that complex issues beg for balance. You may have heard recently that Kelly Gallagher, one of my favorite literacy gurus, made big news at the International Reading Association’s 2014 conference when he announced his shift from a 50/50 approach to a 25/75 approach with less whole-class shared texts and more independent choice reading. I would have LOVED to have been in New Orleans this year to hear him speak more about this shift, but—while I anxiously wait for his next book whenever that happens to be released—I have to say that I don’t think we need a magic number declaring the right balance for every classroom and every student. I doubt that Gallagher would falsely hold out some “promise of a simple, ‘magic bullet’ solution to the literacy failure of millions of children” , but it certainly feels that way. Especially if, like me, most teachers and administrators only got to follow along with the #IRA14 hashtag and were left to interpret Gallagher’s big 25/75 announcement rather than hear how he made this decision for his specific students. Unfortunately, like so much of the other research and anecdotal evidence out there, there are already ELA decision-makers waving this magic number over all teachers and all kids. Now that the school year is over (for most of you), I want to step back and hear what’s happening in YOUR classrooms and schools. Take a minute to fill out the survey below. Share it with your teacher friends and colleagues, so we can get a broad perspective of what balance looks like across our schools. Thanks for your participation as we continue this conversation! Teachers know that most adolescents lack motivation to read, both academically and recreationally, yet we can see how crucial it is for students to develop reading interest and stamina in order to become competent readers and flourishing adults. As a kid, like most of you, whole-class novels built up the entirety of my ELA curriculum; however, there was (and still is) a huge push across the last decade or so for more independent choice reading. Yet as with most things in education, with that push, it’s obvious that there has been an even more recent reactionary, theoretical pendulum swing back towards more rigorous, shared texts, inspired by the CCSS or otherwise. Unfortunately, when districts try to operate from these competing and drastically swinging philosophies, this further inhibits adolescents from becoming life-long readers. It’s frustrating—I’m saying this in the most mild-mannered sense, because trust me when I say that some days I’m beyond frustrated—because there is some much literature out there that presents competing and often misunderstood theoretical perspectives. If you’re reading this blog, than you’re probably just like me, a self-proclaimed, literacy professional literature junkie. You love studying the craft and working to foster adolescent literacy. You’ve read everything from Rosenblatt, Krashen, Allington, Beers & Probst, Lesesne, Schmoker, Fisher & Frey, Gallagher, Allen, Burke, Harvey & Goudvis, Keene, Marzano, Kittle, Newkirk, Routman, Smith, Tovani, Miller, and on and on and on. You’ve read it all. The thing is these texts should work to inform our knowledge of adolescent literacy and thus impact our classrooms. Instead stakeholders (other teachers, coaches, administrators, parents, publishers, politicians, etc.) take these sometimes competing philosophies and—rather than take what these researchers have to say and find a balanced approach—use them to make drastic, one-sided decisions that have long-term impact on students. Sadly, this dispute of philosophy begins to ignore the canon of research and slip slides its way into the classroom, appearing as very heated English department debates, Twitter battles, and blog rants (maybe a bit feisty like this one!) that call for either more rigor that whole-class novels provide or bemoan the disparity of voluminous reading that only choice novels can offer. Teachers question whether novels should be shared as a whole-class texts or if students should freely chose novels according to their own interests and plans for growth, when instead these stakeholders should be discussing ways to find balance between them. Over the course of the next few weeks, I want to expand the conversation about whole-class novels and choice-only reading. I’m going to do my best in this blog series to share and translate the vast body of research on both “sides” of this debate. In a dispute that has very loud voices on either end, it may be unpopular to ask stakeholders to “chill out” and just seek some balance, but I encourage you to share the research you’ve read and experiences you’ve collected in your own classroom. There’s no need for the literacy pendulum to keep swinging when there is still so much work for us to do. I look forward to engaging with you in this important goal. 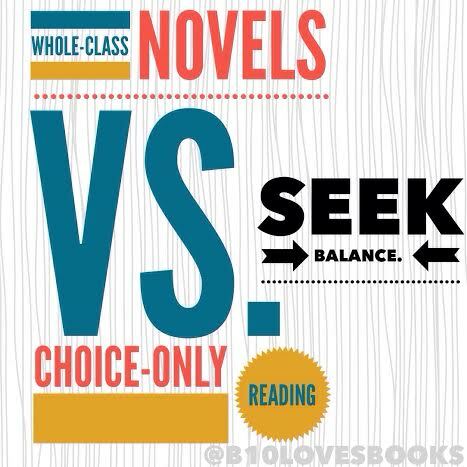 Either respond here in the comments section or tag me on Twitter (@B10LovesBooks) using the hashtag #seekbalance. Thank you. Our Social Studies PLC has been talking a lot lately about academic vocabulary. For me, the research guru on this one is a no brainer: I follow what Marzano, Pickering, and Pollock say in Classroom Instruction that Works (2001). When you get past all of Marzano’s talk about standard deviation and statistical analysis of best practice, you find that he suggests a fairly simple and systematic process. Unsurprisingly, I notice that when I rush through these stages or skip one of the steps, my students’ knowledge of the concepts drops! But, somehow–despite our better judgement–we do this! When we ignore the research, hurrying our lesson along to the “fun” or “trendy” activity, our students actually miss the chance to deepen their understanding of what really matters. The same goes for choosing too many terms. If I have some forty+ academic vocab words for each unit, how can I seriously think that 1) my students are going to master them all and 2) all of the terms really are essential? In some ways, this makes me think back to my own World History class in ninth grade (i.e. “AP Coloring”… We spent A LOT of time coloring in maps that year!). Back in the ’90s, my teacher would give us a study guide of 30+ vocab terms, send us to the back of our textbooks to record the definitions, and chillax at his desk. I don’t know what exactly he was doing at his desk; it’s certainly not like he was surfing the Internet back then. Regardless, this kind of vocabulary instruction was ineffective then and still is today. For me, Marzano’s rules can be followed simple enough. Sometimes, I’ll even “fancy it up” and provide my students with printed boxes for the vocabulary notes, but most of the time, we just use our notebook pages and draw boxes as we go. 1. I start by giving the students a slightly more scholarly version of the term’s definition. 2. They translate the definition into their own words, either independently or by turning and talking to a neighbor, and record them in their notes. 3. Next, I draw my own quick sketch of the term. Trust me! This doesn’t have to be Caldecott-worthy artwork. Most of the time, mine are stick figures, and my fifteen-year old art critics tease me because I’ve given Carnegie three eyes or whatever. 4. As I’m creating my thirty-second masterpiece, students sketch their own images. Sometimes they replicate my drawing, but mostly they come up with something on their own, far better than my original. Depending on the unit and the particular vocab terms, we sometimes do a kinesthetic mix-up. Instead of drawing our “non-linguistic representations,” we create quick, dance moves to correspond with a few of the terms. Mostly these are simple, impromptu moves that we create on the spot during our interactive lectures. What’s interesting is that I notice some kids subtly moving through the physical representations during our assessments. If a kid’s gotta break out the Sherman Anti-Trust Act dance move in order to remember it’s deeper meaning, I say go for it. 5. Lastly, we continuously reference the terms throughout the unit. Each time they close read a new primary document or revisit the concept in an Article of the Week, I point it out on our unit’s anchor chart, discussing the variations of meaning. I know anchor charts dominate most elementary classrooms, but I don’t feel like they get enough playtime at the secondary level. After I started using them a few years ago, I’ve found them central to mentally locking down concepts for students. In my high school classroom, the chart paper moves from the podium (when we’re in the middle of unit) and then stays on the wall the rest of the year. That way we can collect a big picture representation of our months of comprehensive learning. It may not be trendy or even really fun, but research-based vocabulary instruction needs to be an essential part of our instruction. To close, I want to open it up to you: How do you work within Marzano’s process while staying true to the unique needs of your students? Most of ya’ll know my friend and colleague Dave Stuart over at Teaching the Core. A few weeks ago, Stu shared ways that we’re working on supporting students so they can learn to really argue. I wanted to explore this idea over here as a way to both expand the conversation and invite you all to share your experiences teaching argumentative writing. During the last two years, I have been researching ways that I can push my students to be better academic writers. I’m really fortunate in my district that students come from a rich, narrative writing workshop in the middle school, so my students were entering the high school able to free-write with great stamina. I’m lucky also because my students are incredibly passionate about big issues (ex. they’ve raised thousands of dollars for Charity:Water in ninth grade World History). But–even though my students had these strengths–I was noticing that they struggled to clearly organize their ideas, and their writing seemed to lack conviction, despite all that big passion. It was becoming more and more obvious that the freedom and love of a narrative writing workshop wasn’t transferring to the disciplinary writing being asked of them in their other core subjects, namely the informational and argumentative writing tasks in social studies and science. So, let’s be honest, this learning gap—which spans this chasm between totally focusing on love and freedom to actually working towards rigor and the realistic demands of life—only hints at the major imbalance facing current adolescent literacy instruction. This year I’d like to explore this imbalance with more than the “Tips” series has allowed me to do so far on the blog. Today, I’ll just take a small step towards this debate by saying that ELA teachers, even those who follow a totally free-style writing workshop, have to realize that students need to learn how to take a stance and use textual evidence to support their ideas. From English and science to art and social studies, all content teachers need to make expository and argumentative writing the major writing focus across all content disciplines. Q: How can my students start practicing the language of scholars? Q: How can my students learn formal structures without losing their autonomy? –and how could I teach those structures without selling my soul to some standardized test? Q: How can my students write effective arguments, according to a standard of excellence? Over the summer, I spent time reading and researching these problems with the Lake Michigan Writing Project. My LMWP friends pushed me in my role as a teacher-researcher, urging me to explore how writing instructions needs to teach kids to stretch their thinking, to extend their analyses, to pull apart their claims and examine the details of an argument. 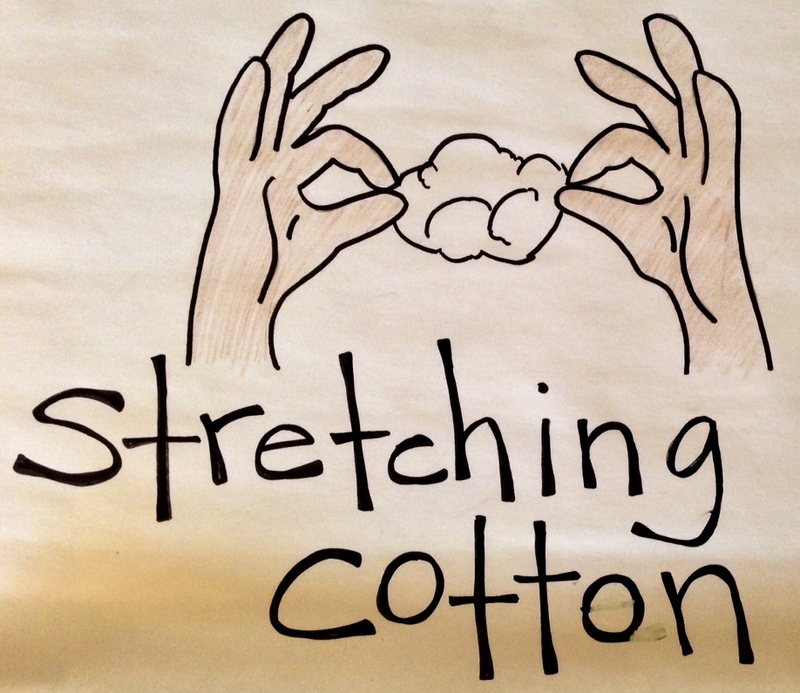 “Stretching the Cotton” became one of the metaphors I began using with my students to discuss the importance for a writer to elaborate her argument, highlighting the tiny fibers which hold it all together. Another way to get these ideas to stick is this simple chant we’ve been using for years: “Blend-In, Quote, Talk-About-A-Quote. Blend-in, Quote, Talk-About-A-Quote.” Trust me when I say, I try to make it as annoying as possible, so it gets stuck in kids’ heads when they’re writing non-narrative essay. So annoying, in fact, that we have accompanying dance moves for the chant. My students and I read, analyzed, and emulated the arguments of published authors, like Gallagher suggests in Write Like This: Teaching Real-World Writing Though Modeling and Mentor Texts. Namely, we studied “Articles of the Week” that had an argumentative slant, like those found at The Week and The New York Times Room for Debate, and, more specifically, we frequently examined the work of Pulitzer Prize winning columnist Leonard Pitts (I love, love, love his work). To do this type of text study, we use our “First Draft Read” to explore the texts for content, and our “Second Draft Read” invited students to share what they noticed the writers were doing, like structure, tone, and use of research. Along these same lines, I regularly wrote arguments in front of my students, whether it was modeling their assignments in class or and sharing my process of writing my Master’s project at home. In particular I wanted to model for my students how I use sentence starters or “brushstrokes” from Graff and Birkenstein’s book They Say, I Say: The Moves that Matter in Academic Writing. I know, I know, I’ve mentioned this book many times before. A lot of colleges are requiring this book for their freshman writing classes; however, I think that it should be in the hands of all high school freshmen. My high school’s English Department included some of the They Say, I Say templates in our high school’s Academic Writing Handbook that we distribute and host online each year. This way all students and staff have access to the same common language. Great news! Jim Burke, author and teacher extraordinaire, just announced that he’s teaming up for the third edition of They Say, I Say high school edition! Keeping the end in mind–writing effective academic arguments using the language of scholars–, I worked backwards to meet students at their level of proficiency. We began with high support: the two-paragraph “They Say, I Say” argument structure presented in Graff’s Clueless in Academe: How Schooling Obscures the Life of the Mind. The general argument made by author X in her/his work, __________, is that __________. More specifically, X argues that __________. She/he writes, “__________.” In this passage, X is suggesting that __________. In conclusion, X’s belief is that __________. In my view, X is wrong/right, because __________. More specifically, I believe that __________. For example, __________. Although X might object that __________, I maintain that __________. Therefore, I conclude that __________. I love how clearly this structure breaks down the They Say (Paragraph One) and the I Say (Paragraph Two), and within that, the structure explicitly guides students through “Blend-In, Quote, Talk-About-A-Quote” with multiple opportunities to elaborate and “stretch the cotton.” It gives them various brushstrokes to try out as they learn the formal structures of academic writing. In the beginning of the year, I required that all students use this format to write their Article of the Week one-page responses. As we’ve moved through the school year, students have been individually “released” from this high structure when they have shown that they’ve mastered it. Students next step is to begin trying out the various sentences stems on their own. The hope is that–with time and repeated practice and modeling–they will use these strategies independently. Is the U.S still a “land of opportunity”? I would say yes. I say yes, because in the U.S you can grow up in a poor family. But if you work hard and put in the detection [dedication], you could eventually be in the middle class or even the upper class. Another reason why i say yes is because, back when the U.S was first discovered people would come over and start new lives. Like people today, we still have the same opportunities. Its just harder to get it. my last reason is because there are a ton of scholarships for you to get, And that can help pay for a lot of the college coast.Today in America if you graduate high school with a 4.0, you can get into almost any college you want to. You don’t always have to go to a college thow. We have the option to go to a trade school. If you go to a trade school. The only thing you need is your high school diploma or a GED. In America you don’t even have to graduate high school, you can take a test and get a GED. Aside from the lack of “They Say” research support, you can see that because this truant student has missed out on the opportunity to study mature mentor texts, he is following a very elementary organizational structure: starting off with the question, answering with a yes/no, and the very unsophisticated idea transitions (ex. “Another reason why I say yes is because…”). It’s obvious that the student doesn’t know the language of scholars, so he has to fall back on language that is beneath him. Furthermore, he hasn’t expanded his argument to really develop his claim of the United States being a land of opportunity. Conversely, this is just an excerpt from the same student’s argument during Trimester #3. (Note: His attendance didn’t really improve, but his writing did make some gains.) This time, students were asked to argue whether or not it’s justified to do immoral or illegal acts in response to threat. Many spoke specifically about how we, as global citizens, responded to the threats of WWII. Again, the students had to ground their argument in textual evidence. we did not respond appropriately to the japanese internment camps. Here many critics would probably object that the camps were good because they took the people that were a threat to us and they held them all up. There was then no other way they could get information from us, through spy work. In other words, the spies aren’t free, so they couldn’t get involved with our military or armed forces. On the one hand, they are right to say that spy work was going on. On the other hand, it is still true that they were taking pretty much what was going on in Germany and doing it in the US. They thought that they had more of a reason. Basically, Germany was having a genocide going on, and that was the whole reason for the war. When we took people and put them in a camp, it was just like Hitler was doing in Germany. to put it another way, he was taking Jews from their homes, taking their jobs, and pretty much destroying their whole lives, by making them into animals. According to PBS’s “Internment History, “They were forced to evacuate their homes and leave their jobs; in some cases family members were separated and put into different camps. President Roosevelt himself called the 10 facilities “concentration camps ” (PBS ). In making this comment, PBS argues that this was the same concept that was going on in germany to the jews as what we were doing on are home to the Japanese-Americans. Ultimately, what is at stake here is that they’re mistreating the Japanese-Americans, like they’re not humans. Everyone should have equal rights, no matter what is going at the time. Just because someone’s ancestor is bombing their new homeland, it doesn’t mean it’s their fault; therefore, they’re not to blame for the attack…. Although this scene may seem of concern to only a small group of people, it should in fact concern anyone who cares about citizens of the United States, because they are American citizens, so obviously they have the same rights as any other American citizen. 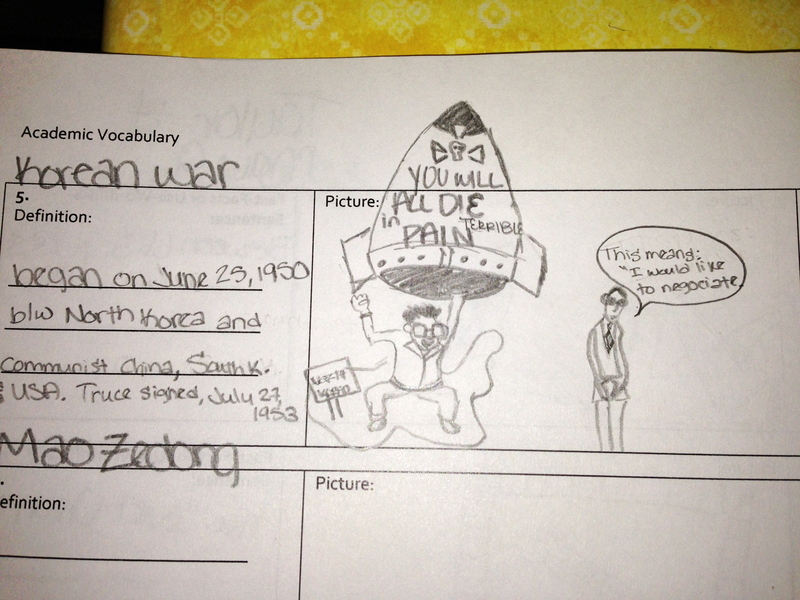 Clearly, we did not respond appropriately to the japanese internment camps. This go-round, it’s obvious that he was able to develop his argument, add research evidence, and maintain a more sophisticated tone. Seriously, I wanna know! As I continue to research this dilemma, I’d love to collaborate with you, hearing what works and what doesn’t at your various grade-levels. Q: How do you find a literacy balance between the love/freedom and rigor/realistic demands of life? Q: How do you help your students start practicing the language of scholars? Q: How do you support your students as they learn formal structures without losing their autonomy? –and how do you teach those structures without selling your soul to some standardized test? Q: How do you teach your students to write effective arguments, according to a standard of excellence? As teachers, we all know that public education is sometimes criticized by the media and those responsible for making education policy decisions. That’s why I want to thank Charles Honey and the School News Network for their continuous effort to shine a light on what’s working in public education across West Michigan. Moreover, I appreciate how thoughtfully Charles captured who we are in Tech 21 Academy of Cedar Springs High School. It was such a treat for our students and staff to have you as a guest in our Academy. Sometimes it can be easy to get discouraged by the budget-cuts and bureaucracy of public schooling, so it just means that much more when efforts like this are made to celebrate the things that really count. 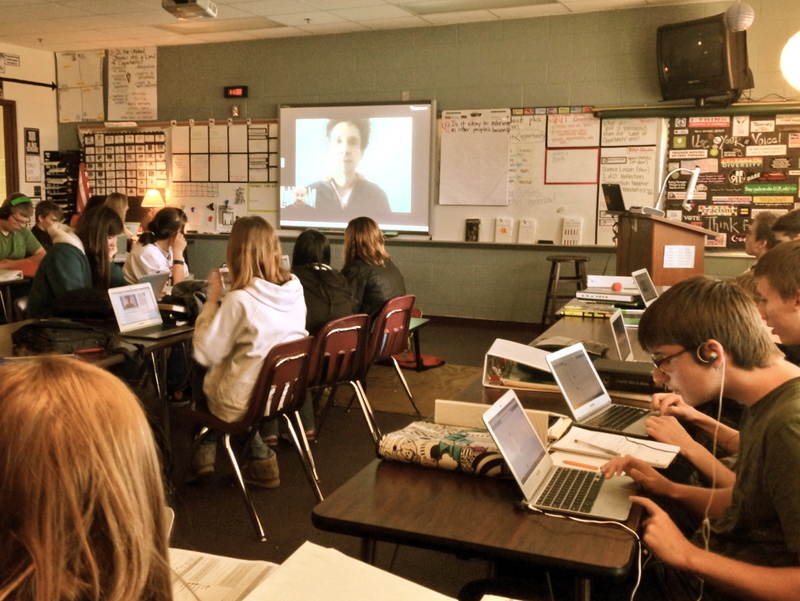 Last week, I was fortunate to experience one of the highs of my teaching career: my students participated in a live web chat with author Malcolm Gladwell. Students carried their understanding of success over to issues of today, especially in terms of economic mobility and racism/xenophobia. They read current Articles of the Week which expanded this conversation, such Leonard Pitts’ “Miss America and Social Media’s Ignorant Bigotry” and my favorite New York TImes Room for Debate piece. So, like most of our History units, they read, researched, debated, and wrote arguments, and, finally, to make their learning truly authentic, this time they got to interact directly with the author! We had the “lucky opportunity” and solid “timing” to participate in this live web-chat hosted by Goodreads. To put it simply, the students were totally geeked. I mean, when I shared the video chat invitation with my sophomores, one student–who was being totally genuine–actually shouted, “Are you serious? We get to talk to Malcolm Gladwell!” What made the experience even cooler–if I can fangirl a bit here–was that Gladwell answered a number of my students’ direct questions, one being the very girl who had gushed about the chance to talk to him. I often hear about other savvy teachers bringing authors in to chat with their students. I admit that, until this experience, I was really nervous about the engagement of my students, flexibility of my colleagues, and investment of time and planning, but, in the end, it worked out so well that I’m definitely going to seek out opportunities like this in the future. As a ELA conclusion to this unit, the students just began reading The Other Wes Moore: One Name, Two Fates. They’re doing profound work connecting Gladwell’s ideas about success to Moore’s question of fate.